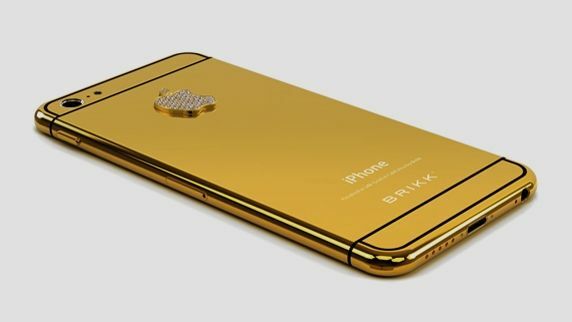 Luxury tech modder Brikk has opened up pre-orders for bejewelled iPhone 6 handsets coated in precious metals like gold and platinum. For instance, the site lists a 128Gb iPhone 6 covered in 24-carat yellow gold with a diamond-encrusted Apple logo, marking up at a staggering $8395 - roughly £4950. "The Lux iPhone 6 will be released in September or October," reads the site, touting an estimation based on little more than speculation. If you're looking to snag one of these premium blowers then you'll need to throw down a deposit of at least $500 ( £295). Once the iPhone 6 is officially released, the remaining dosh will be deducted from your account. All of the Lux devices are hand-polished and assembled at the Brikk lab in Los Angeles, with the firm assuring would-be owners that the phone will be brand new and OEM certified. "Lux iphone 6 will ship within 4 weeks of official iPhone 6 release. Specifications, images, and information cannot be guaranteed and is subject to change based on the actual release of iPhone 6 by Apple Corporation." According to the site, every handset will be GSM unlocked for world wide use, and will include a one-year Brikk warranty. We're unsure as to whether the plating voids Apple's own warranty at this point. The lavish smartphones ship in a custom metal box with all the usual Apple trimmings, as well as a certificate of authenticity. Check out swanky Lux line of Apple handsets over at its website, as well as similarly exorbitant versions of the iPad Mini and Air, the Galaxy Note 3, the HTC One M8, and even the Galaxy Gear smartwatch.